Austrian physician; born at Bechtheim, Rhein-Hessen, Dec. 27, 1842. He studied at the universities of Heidelberg, Giessen, and Tübingen (M.D. 1865) and took a postgraduate course at the universities of Heidelberg and Vienna, becoming privat-docent in the latter in 1869. In 1870 he removed to Prague, where he became privat-docent at the German university and assistant at the physiological institute. He was appointed assistant professor in 1872; became chief of the histological institute in 1880; and was appointed professor of histology in 1884. 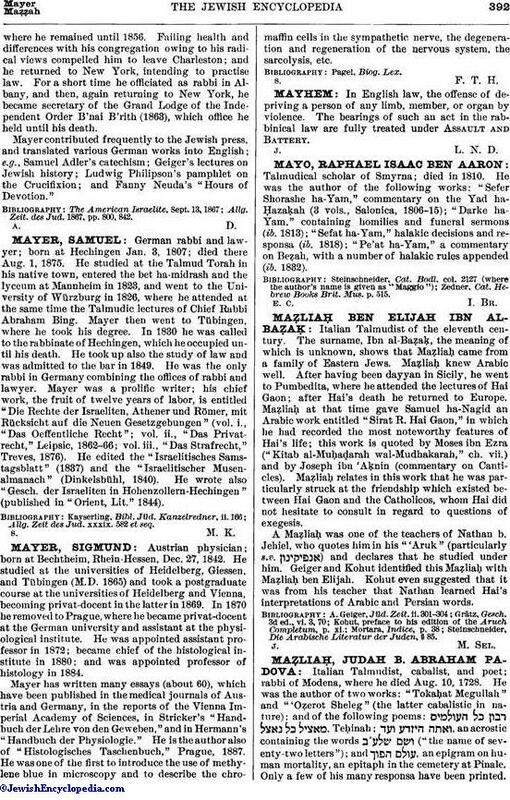 Mayer has written many essays (about 60), which have been published in the medical journals of Austria and Germany, in the reports of the Vienna Imperial Academy of Sciences, in Stricker's "Handbuch der Lehre von den Geweben," and in Hermann's "Handbuch der Physiologie." He is the author also of "Histologisches Taschenbuch," Prague, 1887. He was one of the first to introduce the use of methylene blue in microscopy and to describe the chromaffin cells in the sympathetic nerve, the degeneration and regeneration of the nervous system, the sarcolysis, etc.